On my third trip to Equatoria, I traveled through the town of Loka, a beautiful place nestled in an impressive teak forest and spotted with mango trees. The people of Loka were very kind to me. During that trip, I came across an abandoned school campus. I was given a brief history of the school and was guided through the bush to examine the crumbled buildings. As I walked, I prayed. I wondered if this school could somehow be restored. My thought was that we could start with one classroom and then, if God blessed our work, we would grow from there. I knew that the only way that the school would be a success was if it could be self-supported and self-governed. In order for the school to be successful, it had to have community participation from the very beginning. This one time thriving institution was one of the finest secondary schools in South Sudan. 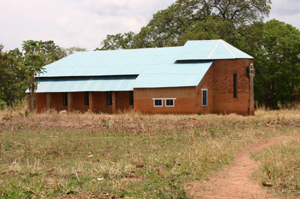 A British missionary named Nugent originally built the school in 1929 (the school had been named the Nugent School in memory of it’s original builder). Some of South Sudan’s finest leaders were educated in this school. Due to the war, the school was abandoned and overtaken by the bush. Trees slowly grew through the foundations of the buildings, which cracked the walls and floors. Many of Loka’s citizens fled to Uganda as refugees due to the deterioration of the community. In January 2002, Global Response Network began the renovation of the Nugent School. With the supervision of our ground staff, a workstation was built and an assessment of the school campus was made. The GRN staff began with very little. With only a few tukuls (mud dwellings) and a couple of bicycles, our staff, along with the help of the community and its leaders, began to clear away the bush and plan for the renovation of the school. Although there were many difficult days and many challenges to overcome, a plan took shape. After ten years of hard work, GRN and the citizens of Loka have successfully renovated (by hand and without power tools) four classrooms, three offices, four dormitories, a chemistry lab, one reading room, the headmaster’s quarters, housing for ten teachers and the school chapel. 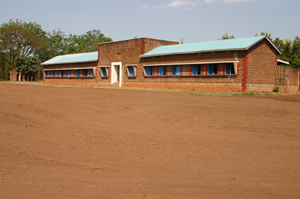 The school currently has ten teachers. The student body has grown from eight (in 2002) to over 300. 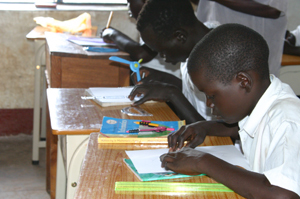 Though South Sudan is still a volatile area (despite the peace treaty being signed in 2005 and gaining their own sovereignty in 2011), restoration and Christian education continue to move forward in the name of Jesus. Now, we at GRN have moved our work station to Koggi Village (Juba County), to begin construction of a much needed Christian nursery school, a chapel and vocational training. Please keep up to date with this project on our blog.